Murray Church was built by Reverend George Murray in 1876. 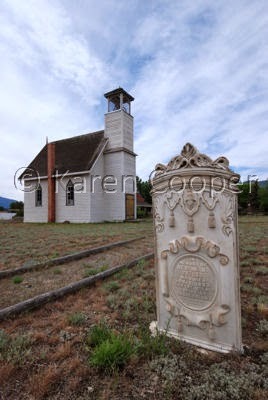 The church is situated in Nicola Valley, British Columbia, Canada along Highway 5A north of Merritt. There's a lot of history in this area, with its dry, rolling, sage brush covered hills. Right out of the old west cowboy movies, complete with cactus. I'm still picking the thorns out of my knees from photographing Murray Church. No sacrifice is too great for art I say. There are a lot of lakes in this area teaming with trout ready for the frying pan. There is a music festival every year at Merritt, called the "Merritt Mountain Music Festival" and draws some big names in country music. I can see what drew the good Reverend Murray to fall in love with this area. There is a feel of timelessness to it here, a small town "Say hello to everyone you meet"on the street feel. Warm breezes and friendly smiles, and the incredible intoxicating smell of sage brush.